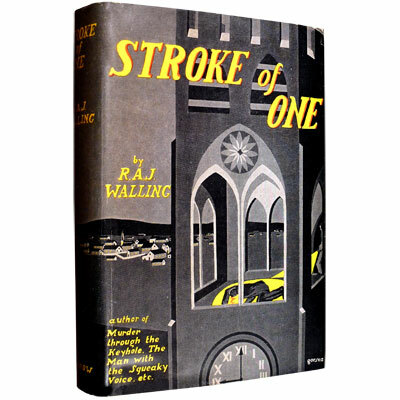 Stroke of One - R. A. J. Walling 1931 - Wm. Morrow & Co., New York - First American Edition	A superb copy of Walling’s fifth novel, and the first to feature detective Bill Garstang. Robert Alfred John Walling (1869-1948), was British journalist and later a magistrate in Plymouth. He did not begin to write mysteries until he was nearly sixty, his series characters were inspector Bill Garstang and the upper-class private investigator Philip Tolefree. Published in London the same year, under the same title. Reference: Haycraft, Murder for Pleasure, 155. Symons, Bloody Murder 114. Reilly,Twentieth-Century Crime and Mystery Writers (1980), 1435. Provenance: Small stamp of Damato’s Book Store, 32 East 28th St., to rear free endpaper.